From interpreting the world to changing it, a synthesis of Chomsky's early work on philosophy, linguistics, and politics. Originally delivered in 1971 as the first Cambridge lectures in memory of Bertrand Russell, Problems of Knowledge and Freedom is a masterful and cogent synthesis of Noam Chomsky's moral philosophy, linguistic analysis, and emergent political critique of America's war in Vietnam. In the first half of this wide-ranging work, Chomsky takes up Russell's lifelong search for the empirical principles of human understanding, in a philosophical overview referencing Hume, Wittgenstein, von Humboldt, and others. In the following half, aptly titled "On Changing the World", Chomsky applies these concepts to the issues that would remain the focus of his increasingly political work of the period - his criticisms of the war in Indochina and the Cold War ideology that supported it, of the centralization of US decision-making in the Pentagon and the growing influence of multinational corporations in those circles, and of the politicization of American universities in the post-World War II years, as well as his analyses of the Cuban Missile Crisis and Nixon's foreign policies. 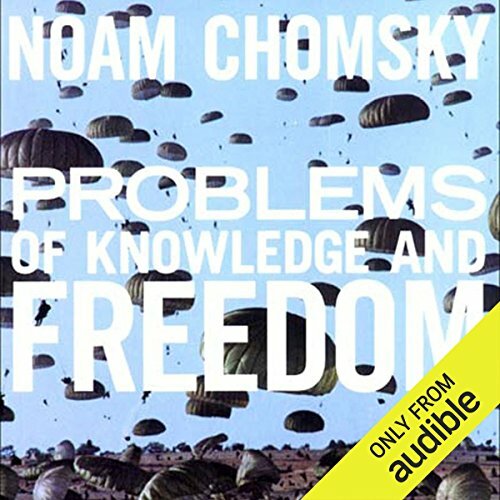 ©1971 Noam Chomsky (P)2014 Audible Inc.